Although it is well established that compromised systolic function predicts cardiovascular (CV) complications in symptomatic and asymptomatic patients with ESRD, it still is unknown whether repeated echocardiographic measurements of systolic function in asymptomatic patients with ESRD is useful for monitoring the evolution of cardiomyopathy in these patients. The prognostic value for CV events of changes in systolic function, as measured by midwall fractional shortening (mwFS) in a cohort of 191 dialysis patients, was tested. Echocardiography was performed twice, 17 ± 2 mo apart. Changes in mwFS (ch-mwFS) that occurred between the second and the first echocardiographic studies then were used to predict CV events during the ensuing 27 ± 13 mo. After the second echocardiographic study, 85 patients had incident CV events. In a Kaplan-Meier analysis, there was a graded increase in the risk for fatal and nonfatal CV events across ch-mwFS quartiles (P = 0.005). On multivariate Cox regression analysis, ch-mwFS maintained an independent association with CV outcomes. In this analysis, the risk for CV events was 51% lower in patients who manifested an increase in mwFS (hazard ratio 0.49; 95% confidence interval 0.27 to 0.88; P = 0.02) than in those who had a decrease in mwFS. 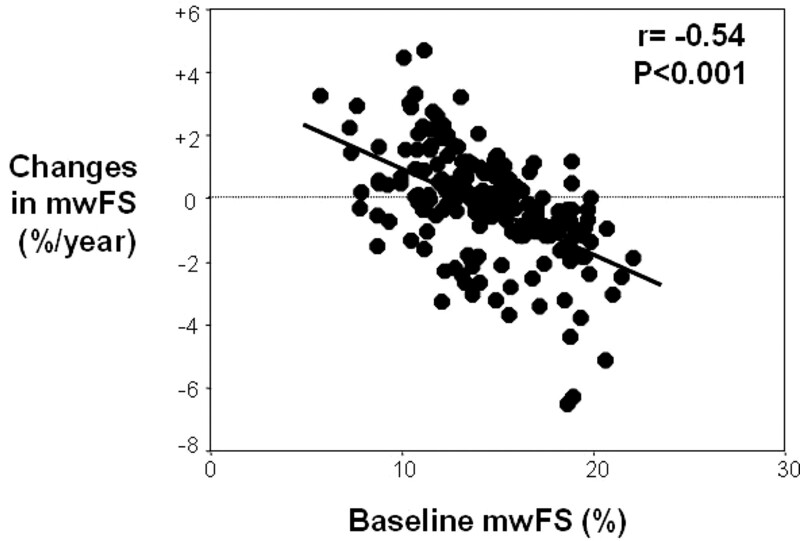 Changes in mwFS have an independent prognostic value for CV events, and periodic echocardiographic studies of systolic function are useful for monitoring asymptomatic dialysis patients. Heart failure is a pervasive cardiovascular (CV) complication of ESRD (1,2) that entails a very high risk for mortality and hospitalization (3). Specific recommendations have been issued by the National Kidney Foundation for the study of cardiomyopathy and the prevention of heart failure in patients with ESRD, and echocardiographic studies are indicated as a fundamental means for guiding risk stratification and treatment of these conditions (4). Asymptomatic left ventricular systolic dysfunction (LVSD) represents a preclinical stage of heart failure (5), and in a recent study, we found that this dysfunction, estimated on the basis of the midwall fractional shortening (mwFS), has a 48% prevalence in ESRD (6). In the general population, asymptomatic LVSD predicts all-cause and CV death and nonfatal CV events such as myocardial infarction and stroke (7). In a population with a high prevalence of heart failure, baseline LV fractional shortening (8) and LV fractional shortening changes (9) predicted overt cardiac decompensation, an observation that emphasizes the progressive nature of cardiomyopathy in patients with ESRD. We recently reported that, in asymptomatic dialysis patients, compromised mwFS entails a high risk for CV events (6), suggesting that this indicator is a useful marker for risk stratification at a preclinical stage in this population. Preventive strategies demand that alterations that may evolve into more severe disease stages not only be screened or detected but also be monitored periodically. In this regard, it still is unknown whether, in asymptomatic patients with ESRD, repeated echocardiographic measurements of systolic function by mwFS have an independent prognostic value, i.e., a prediction power for CV complications above and beyond that provided by a single measurement and by established risk factors. The problem goes beyond ESRD because the effect of progression of asymptomatic LVSD as assessed by echocardiography has not been studied at the population level (7). In this study, we therefore analyzed the prognostic value of serial measurements of mwFS in asymptomatic dialysis patients who attended the baseline and the follow-up echocardiographic evaluation in the Cardiovascular Risk Extended Evaluation in Dialysis patients (CREED) study, a prospective cohort study that was conceived to assess the prognostic value of alterations in LV mass and function and other risk factors in the dialysis population. The protocol was in conformity to the ethical guidelines of our institutions, and informed consent was obtained from each participant. All studies were performed between 8 a.m. and 1 p.m. The original dialysis cohort was formed by 283 patients (158 men and 125 women). At enrollment, these patients had been on regular dialysis treatment for at least 6 mo (median duration of regular dialysis treatment was 41 mo; interquartile range 18 to 93 mo). The enrollment criteria in this cohort were no history of congestive heart failure (defined as dyspnea in addition to two of the following conditions: raised jugular pressure, bibasilar crackles, pulmonary venous hypertension, or interstitial edema on chest x-ray that required hospitalization or extra ultrafiltration ), left ventricular ejection fraction ≥35%, and no intercurrent or terminal illnesses. Thirty-one patients were excluded because of low-quality echocardiographic recordings. Therefore, 252 patients (142 men and 110 women) entered this study. The main demographic and clinical characteristics of the cohort are detailed in Table 1. All hemodialysis patients (n = 201) were virtually anuric (24-h urine volume <200 ml/d) and were being treated thrice weekly with standard bicarbonate dialysis (138 mmol/L Na, 35 mmol/L HCO3, 1.5 mmol/L K, 1.25 mmol/L Ca, and 0.75 mmol/L Mg) and cuprophane or semisynthetic membranes (dialysis filters surface area 1.1 to 1.7 m2). The average Kt/V in these patients was 1.22 ± 0.27. Chronic ambulatory peritoneal dialysis (CAPD) patients (n = 51) all were on a schedule of four exchanges per day with standard dialysis bags. The average weekly Kt/V in these patients was 1.67 ± 0.32. A total of 134 patients were on treatment with erythropoietin. A total of 110 patients were being treated with antihypertensive drugs (77 on monotherapy with angiotensin-converting enzyme inhibitors, AT-1 antagonists, calcium channel blockers, and α and β blockers and 33 on double or triple therapy with various combinations of these drugs). Thirty-nine of 252 patients who entered this study died before the time at which the second echocardiographic study was performed, five patients underwent renal transplantation, and 17 patients could not repeat echocardiography for logistic reasons. Therefore, 191 patients were left for this study that aimed to define the prognostic value of changes in mwFS (ch-mwFS; Table 1). After the initial assessment, patients were followed up by the nephrologists who participated in the study. The study was purely observational; therefore, changes in treatment policy were not contemplated. The second echocardiographic study was performed from 11 to 23 mo (average 17 mo) after the baseline study. The overall duration of the follow-up was 45 ± 13 mo. The duration of follow-up after the second echocardiographic study was 27 ± 13 mo. Because we were interested in establishing the prognostic value of ch-mwFS, all survival analyses that are reported herein apply to the follow-up after the second echocardiographic study (see Statistical Analyses section). During the follow-up, CV events (electrocardiographically-documented anginal episodes and myocardial infarction, heart failure, electrocardiographically-documented arrhythmia, transient ischemic attacks, stroke, and other thrombotic events except arteriovenous fistula thromboses) and death were recorded accurately. Each death was reviewed and assigned an underlying cause by a panel of five physicians. As a part of the review process, all available medical information about each death was collected. This information always included study and hospitalization records. In the case of an out-of-hospital death, family members were interviewed by telephone for better ascertainment of the circumstances surrounding death. As alluded to before, for the purpose of establishing the prognostic value of progression in systolic dysfunction, only events (death and CV events) that occurred after the second echocardiogram were considered. Echocardiographic studies were performed midweek on a nondialysis day for hemodialysis patients and at empty abdomen for CAPD patients. At the time of the echocardiographic examination, investigators who were involved in echocardiographic studies were unaware of patients’ clinical data. Left ventricular mass (LVM) was calculated according to the Devereux formula and indexed to height2.7, as proposed by de Simone et al. (11). The relative wall thickness (2 × posterior wall thickness/left ventricular end diastolic diameter) also was calculated, as an index of the LV geometric pattern. Analysis of LV geometry was done according to Ganau et al. (12). mwFS, which is a reliable indicator of LV performance (interobserver reproducibility 4.0%; intraobserver reproducibility 4.5%) (13), was calculated according to the method of Shimizu et al. (14) as described in full detail by de Simone et al. (15). Ch-mwFS were quantified by subtracting mwFS at the second study from that obtained at baseline study and by factoring this difference for the time interval between the two studies. Systolic dysfunction was defined as mwFS <14% (16). Blood sampling for the measurement of routine and special biochemical measurements was performed before echocardiographic studies. The methods used to determine serum C-reactive protein (CRP) and plasma total homocysteine were detailed in a previous publication (17). Data are expressed as mean ± SD (normally distributed data), median, and interquartile range (nonnormally distributed data) or as percentage frequencies. Comparisons between groups were made by Mann-Whitney test (two groups), Kruskal-Wallis test (more than two groups), and within-patients comparisons by paired t test, as appropriate. The relationship between paired variables was analyzed by Pearson product moment correlation coefficient. The association between ch-mwFS and all-cause death and fatal and nonfatal CV events was analyzed by Kaplan-Meier analysis and by multivariate Cox’s proportional hazards model. In these analyses, patients were divided into three groups on the basis of ch-mwFS (≤50th, 51 to 75th, and >75th percentile) that were recorded between the second and the first studies. For avoiding any analytical distortion attributable to the baseline value of mwFS, ch-mwFS were adjusted for the corresponding baseline value by covariance analysis. For patients who had multiple events, survival analysis was restricted to the first event. The following covariates initially were considered for a stepwise elimination approach: Ch-mwFS as adjusted for baseline mwFS, baseline LV geometry, treatment modality, age, gender, diabetes, and interdialytic weight gain; baseline systolic pressure and heart rate and their changes from baseline to the follow-up visit; previous CV events and antihypertensive therapy; and smoking, serum cholesterol, hemoglobin, albumin, Ca × P and the change in these covariates at follow-up. Furthermore, we tested two emerging risk factors (CRP and homocysteine) that were available at the baseline visit only. By this approach, we constructed models of adequate statistical power (at least 12 events for each variable in the final model). The proportional hazards assumption of the Cox model was verified by Shoenfeld’s method (18), and no violation of proportional hazards was found. To assess the functional form of ch-mwFS (continuous variable or quartiles) into the Cox model, we used the Martingale residuals analysis (19). Point estimates of the probability of fatal and nonfatal CV events, associated with ch-mwFS and with the baseline mwFS, were calculated by using the equation that was derived from the multiple Cox regression analysis reported in Table 2. In this equation, all terms but ch-mwFS and baseline mwFS were set to the corresponding average value. Confidence intervals (CI) of estimated probabilities were calculated by the standard formula (20). Hazard ratios (HR) and their 95% CI were calculated using the estimated regression coefficients and their standard errors in the Cox regression analysis. All calculations were made using a standard statistical package (SPSS for Windows Version 9.0.1; SPSS, Inc., Chicago, IL). The main demographic, clinical, hemodynamic, biochemical, and echocardiographic data at the baseline and at the second echocardiographic studies are summarized in Table 1. Diastolic pressure showed a significant decrease, whereas serum cholesterol showed a small but statistically significant rise. Hemoglobin and Ca × P improved, whereas serum albumin showed a 14% decrease. Overall, there was a small progression in left ventricular hypertrophy (LVH) and in LVSD. On univariate analysis, ch-mwFS were significantly related to baseline measurements (Figure 1), a phenomenon that indicates that changes in systolic function are confounded by regression to the mean. To avoid analytical distortion attributable to baseline mwFS, we conducted further data analysis with ch-mwFS adjusted for the corresponding baseline value. Changes in mwFS were related inversely to antihypertensive therapy (r = −0.23, P = 0.001) and directly to interdialytic weight gain (r = 0.14, P = 0.05). Furthermore, ch-mwFS tended to be inversely related to baseline LVM index (r = −0.12, P = 0.09) but were largely unrelated to the remaining risk factors listed in Table 1 (all P ≥ 0.16). 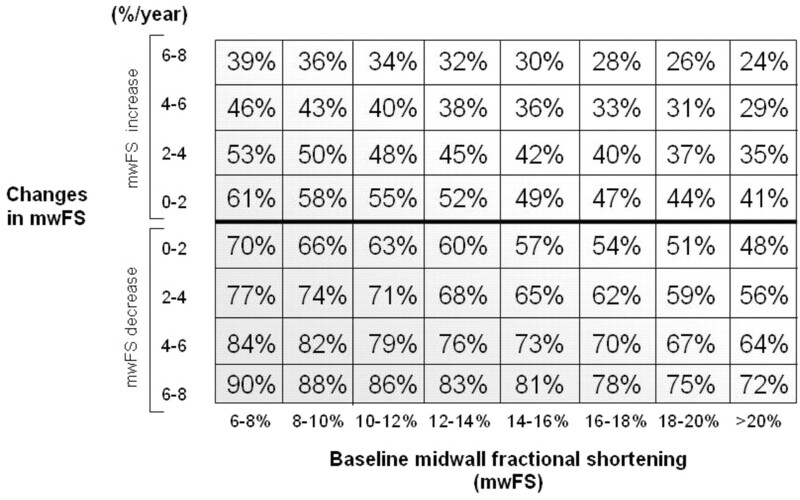 Relationship between baseline midwall fractional shortening (mwFS) and changes in mwFS (ch-mwFS) in dialysis patients. After the second echocardiographic study, 76 patients died. Eighty-five patients had one or more CV events that were fatal in 52 cases. The rate of decrease in mwFS was similar (P = 0.21) in patients who died and in those who survived. By contrast, the reduction rate in mwFS was significantly higher (P = 0.01) in patients with incident CV events (−0.28%/yr; 95% CI −1.07 to 0.46%/yr) than in CV event-free patients (0.17%/yr; 95% CI −0.53 to 0.83%/yr). In a Kaplan-Meier analysis, there was a graded increase in the risk for fatal and nonfatal CV events across the 50th and the 75th percentiles of ch-mwFS (Figure 2), so that the relative risk of patients with ch-mwFS in the fourth quartile [the quartile that included patients who had an increase in mwFS] was 41% lower (P = 0.005) than that of patients with ch-mwFS below the 50th percentile (i.e., those with a decrease in mwFS). Because ch-mwFS were significantly associated with incident fatal and nonfatal CV events and not with all-cause mortality, further data analysis was restricted to the relationship between ch-mwFS and CV outcomes. 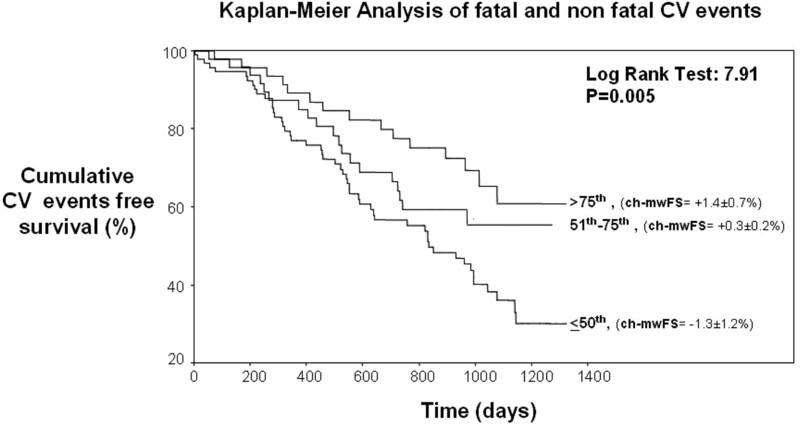 Kaplan-Meier survival analysis of changes in mwFS for incident fatal and nonfatal cardiovascular (CV) events. Patients were divided into three groups according to the 50th and the 75th percentiles of ch-mwFS as adjusted for the corresponding baseline values of this indicator. On multivariate Cox regression analysis, only age, baseline LV geometry, smoking, baseline hemoglobin, hemoglobin changes, and ch-mwFS maintained an independent association with CV outcomes (Table 2). By this analysis, we found that, in patients who manifested an increase in mwFS (fourth quartile average ch-mwFS 1.4%/yr), the risk for fatal and nonfatal CV events was 51% lower (HR 0.49; 95% CI 0.27 to 0.88; P = 0.02) than that of patients who manifested a decrease in mwFS (≤50th percentile average ΔmwFS = −1.3%/yr; Table 2), and this association remained identical also when interdialytic weight gain was introduced into the Cox model. The association between mwFS changes and the risk for fatal and nonfatal CV events is better illustrated in a risk chart (Figure 3) that reports the 3-yr probability of fatal and nonfatal CV events (calculated by using the equation derived from the Cox model reported in Table 2) that are associated with both baseline mwFS (i.e., a fundamental variable to control for the regression to the mean) and ch-mwFS. Three-year estimated probability of fatal and nonfatal CV events in relationship to ch-mwFS and to baseline mwFS. This study shows that, independent of other risk factors, ch-mwFS predict adverse CV events in asymptomatic patients with ESRD. This observation indicates that, in clinical practice, repeated evaluations of LV systolic performance by echocardiography may be useful to monitor CV function in patients who have ESRD without clinical evidence of heart failure. Congestive heart failure entails a very short survival in dialysis patients (21). The progressive nature of this disease demands that great attention be focused in the early, asymptomatic phases of cardiac dysfunction, i.e., when systolic performance starts to decline. In patients with asymptomatic systolic dysfunction, the annual rate of de novo heart failure ranges from 5 to 20% (7). In ESRD, the risk for progression of this dysfunction is of particular concern because its prevalence in dialysis patients is 4 to 7 times higher than that in the general population (6). Compromised systolic function is an ominous sign because it predicts all-cause and CV mortality as well as nonfatal CV events. In a recent study in patients with ESRD, we specifically confirmed that asymptomatic systolic dysfunction entails a high risk for CV complications in this population (6). Although there is cogent epidemiologic evidence that asymptomatic systolic dysfunction is associated with increased mortality and CV complications, the problem of whether progression or regression of systolic dysfunction, as studied by echocardiography, predicts adverse outcomes still is unclear. To our knowledge, the problem has never been examined either in community studies or in clinical trials in the general population. Early detection of systolic dysfunction is important because treatment may retard the progression of this condition toward heart failure (7). It was shown that estimates of systolic function that were based on measurements made at midwall (e.g., midwall fractional shortening) seem to be preferable to estimates that were based on measurements made at the endocardial level (fractional shortening and ejection fraction) (14,15), particularly in populations with a high prevalence of concentric hypertrophy, such as patients with ESRD (22). Assessing the usefulness of serial measurements of systolic dysfunction by mwFS seems of obvious relevance in preventive programs because, in the absence of symptoms, repeated echocardiographic examinations represent an objective means for documenting the effects of treatment. The lack of studies of repeated measurements of systolic function was emphasized in a recent review by the Framingham Heart Study investigators, who recommended longitudinal investigations as a research goal in studies that aim to preventing the evolution of systolic dysfunction toward heart failure (7). These considerations seem particularly relevant in patients with ESRD, a population in which asymptomatic systolic dysfunction is a frequent problem that entails a very high CV risk (6). Because of the lack of knowledge in the general population, our study provides new and clinically relevant information also beyond ESRD. We found that the progression of systolic dysfunction suggests an increased risk for CV complication independent of classical risk factors and risk factors that are peculiar to ESRD, such as anemia. Notably, this excess risk also was independent of LVH, which once again was confirmed as a relevant prognostic factor. Furthermore, the geometric pattern of LVH seemed to be a significant correlate of the progression rate of systolic dysfunction because this alteration evolved faster in patients with eccentric LVH than in those with concentric LVH or normal LVM. Eccentric and concentric LVH are almost equally frequent in patients with ESRD (22). Eccentric LVH is characterized by LV dilation and by a reduction in myocardial contractility (23). Therefore, the faster progression of systolic dysfunction in ESRD with eccentric LVH is in line with pathophysiologic knowledge indicating that this pattern is a marker of compromised pump function. That ch-mwFS predicted adverse outcomes independent of the corresponding baseline measurement in our study is important for two reasons: first, because regression to the mean is a potential confounder in studies that contemplate repeated measurements of the same variable (24), and second, because repeated echocardiographic studies of LV function can be recommended in clinical practice only if serial measurements give prognostic information above and beyond the corresponding baseline measurement. Collectively, these data lend support to the recommendation that periodic application of echocardiographic studies is useful for monitoring asymptomatic dialysis patients. Our study has limitations. Because of mortality and censoring, approximately 25% of patients could not repeat echocardiography. For this reason, the cohort that entered the follow-up study that aimed to establish the prognostic value of serial echocardiographic studies had a lower risk than the original cohort; therefore, it imperfectly reflected the prognostic impact of risk factors in the original dialysis population. Censoring and early death explain why solid predictors of death and CV events in ESRD, such as hypoalbuminemia, high CRP, and asymmetric dimethylarginine and other factors, failed to predict the outcome beyond the time of the second echocardiographic study, which was performed approximately 1.5 yr after enrollment. A shorter time interval between the two echocardiographic studies could have limited this problem, but the shorter the time interval, the less likely it is that meaningful changes in LV function will register. In line with observations that we made in a study that dealt with serial measurement of LVM (25), the observation made in this study suggests that repeating echocardiography after approximately 1.5 yr is useful for risk stratification. Guidelines by the American Kidney Foundation recommend that echocardiography be repeated at 3-yr intervals (4). Our data suggest that significant prognostic information may be obtained after approximately 1.5 yr. The second limitation derives from the fact that LVM and LV function measurements in this study were made by two cardiologists who carefully calibrated echocardiographic measurements on the basis of established standards. In clinical practice, echocardiographic measurements that are made by different sonographers in different institutions may be less reliable. Furthermore, it still remains to be demonstrated that repeated measurements of LV systolic function have a favorable impact in the management of ESRD. The efficacy of a clinical policy that contemplates serial measurements in LV function in patients with ESRD remains to be tested formally in a randomized clinical trial, which is the gold standard for establishing the value of clinical tests.